We are halfway through our Share the Love Week featuring Simon Says Stamp, but we have so much more inspiration, challenges and prizes awaiting you! Today our challenge is: With One Stamp. We are using Scenery: Big Bang Bling, but you can use one stamp set of your choice from Simon Says Stamp or Winnie & Walter and do more than 1 project using that particular stamp set. I admit it. I love stamping backgrounds. I do it again and again. I never get tired of it. So I mixed the large burst from Cupcake Party by Simon Says Stamp and sunburst sequins and large solid faceted sequin from Scenery: Big Bang Bling using Hero Arts Shadow Inks in stone wash, soft cantaloupe and butter bar. I adhered the panel to a grey card base. I stamped the polka dot circle from Cupcake Party in stone wash on white cardstock and die cut it out using a circle die from Spellbinders. I stamped the sentiment using a mix of sentiments from Bubble Talk (hey girl) and Cupcake Party (party!) in black ink. On a banner cut from grey cardstock I stamped the largest sunburst sequin in Versamark. I added the polka dot circle to the banner and adhered the banner to the card using foam dimensional adhesive. Last are some sparkle from sequins. Gayatri and Kelly are joining in with their awesome With One Stamp projects. You can create new project(s) with one stamp (we used Scenery: Big Bang Bling, but you can use one stamp set of your choice from Simon Says Stamp or Winnie & Walter and do more than 1 project using that particular stamp set) using Simon Says Stamp product(s) + at least one (1) w&w product (this can include stamps, cut files, digital products and/or one of our freebies found on our website or for our Facebook fans) and add it to the Link-up tool found below. You may enter as many times as you wish while the challenge remains open. SUPER stamps & stamping combined to create FABULOUS cards - WOW - I don't think anyone needs patterned papers when GORGEOUS backgrounds can be created using stamps!!! Sweet cards! That ice cream bar is calling my name! Shay, I love creating backgrounds, too! Might be a little card rumbling around in my head right now!! Very inspiring cards! Great color combos!! Great cards using this challenge. Great projects! This is such a fun collaboration! Oh, I LOVE today's projects! Awesome stuff from everyone! What a great mix of card styles today! 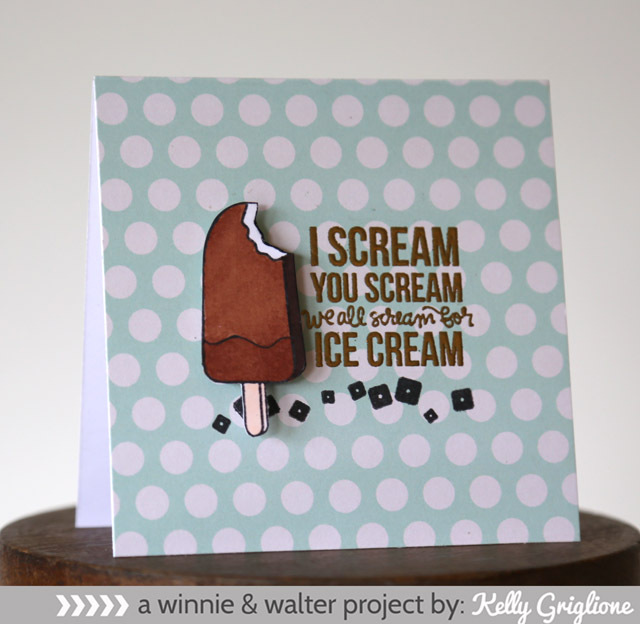 Love the fun ice cream card! Cute cards. Just got done working in the yard and I'd love to scream for some ice cream. 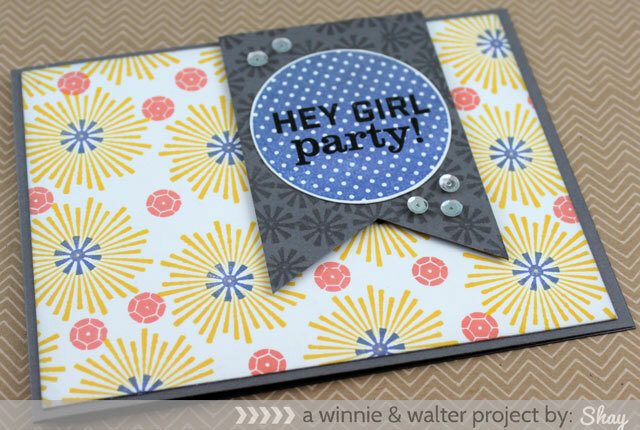 The first card is so cute with the burst of color - fits in with the theme of "let's party". Wow -- what great stamps! Love the cards! Adorable projects. Glad I popped in today! Such great cards! Love the challenge! It's really hard to just pick one stamp set to use! The scenery stamps are so versatile! beautiful cards... love them all!! Love all the inspiration with these cards!!! These are so awesome! Love how happy and bright these are! i am loving this great week of inspiration! I have been wanted to get Big Bang Bling and I think you just convince me…great cards! Fun cards! Love that ice cream design... yum! Great cards! Love this week! Gorgeous cards and love the ideas that come along with them. Really must try making my own background papers with my stamps, brilliant idea!! Super fun samples! Love that fudge sickle! Hope to join in on the fun later today! Another fun challenge - you really are making us look at our stamps more carefully! Love all the examples today! Both W & W and SSS have such great stamp sets, there should be some wonderful cards to see! Fun Share the Love day. Great projects and awesome companies!! Wow! Amazing cards! I love the sunburst combo on Shay's card - fireworks, very celebratory! I need to try and create backgrounds! Awesome projects showcasing this versatile stamp set. I like that you can use it for little accents or to create patterns and backgrounds. These cards are so fun! Love when stamp companies team up for challenges! what a great challenge! love every card! 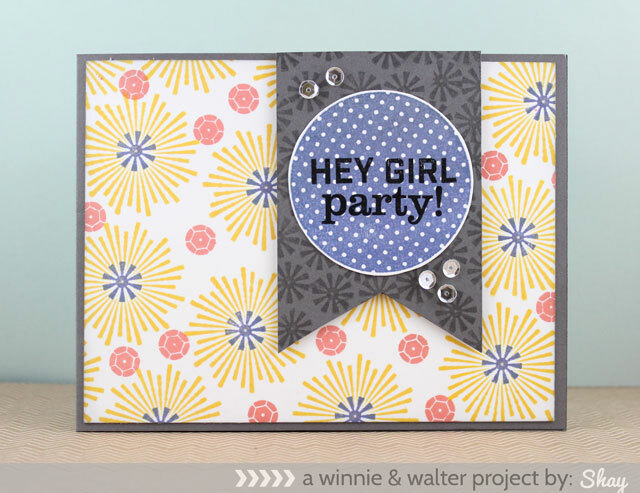 Love the Hey Girl Party card. The dark paper goes well with all of the bright colors. 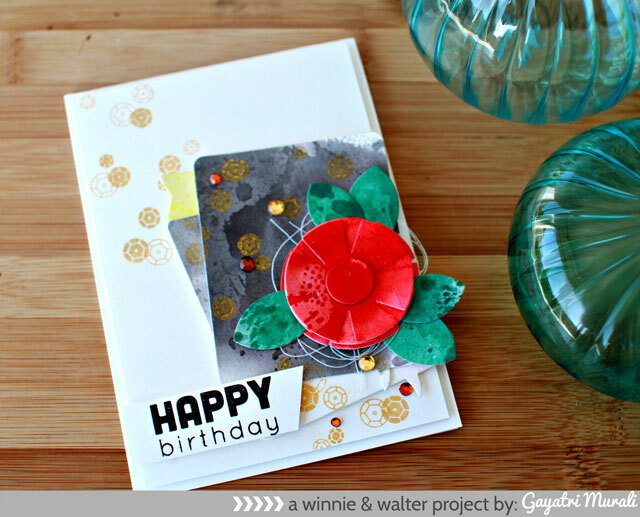 I love the idea of just using one stamp set to create a card. I usually mix and match, so this would definitely be a challenge for me! I have and love, love, love this stamp set. It's soooo versatile. If I was at home I would join in! Another FUN Challenge and GREAT cards too!! Beautiful backgrounds for very pretty cards!! Great inspirations from the DTs! Awesome cards! Love them all. Lovely projects! I hope I can select just one stamp--the hard part is choosing! totally cute projects...love the variety! Fabulous cards! I love all the challenges this week! I love challenges like this...they make you really think about your stamps and use them more creatively. Incredible projects today ladies! Super stamping by the DT! They are cute cute cute cards! I am having a hard time to pick my favorite :D Thanks for the inspirations!